For the premiere, I am going to do each character so we can see what is happening with everyone. Well he got sent back to patrol, while he is doing great on patrol but he got mad and punched a cop which got Loeb to fire him. Now Gordon is unemployed and I think living with Dr. Tompkins. Their relationship is still cute as ever, she really does support him but she also worries about him. Well Gordon knows that he needs to do something crazy in order to get back on the force. He is running the criminal underground, he is more than happy to help out Gordon to get him back on the force but he needs Gordon to do a favor for him first. While Gordon was not going to do it, he does after talking with Bruce, who didn’t realize what he was advising Gordon to do. Well Gordon did his end, so the Penguin did his, which was sending Zasaz down to threaten Loeb into quitting. This was also after the Penguin got some peanut butter. Well when Loeb stepped down, he passed on the Commissioner post to her. 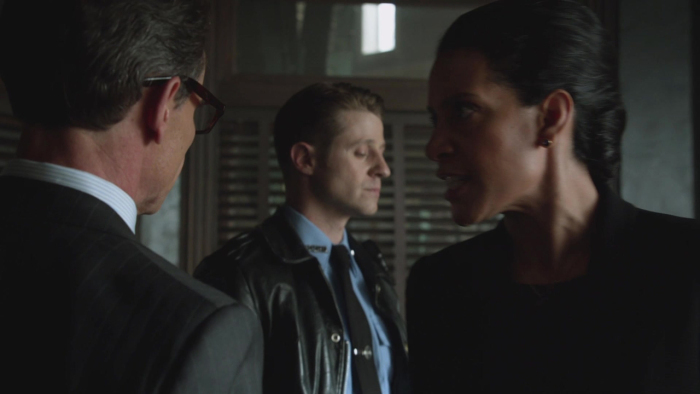 Which was great for Gordon because she made sure put him back on the force. Well he trying to break into his father’s secret room, which he cannot figure out the pass code to. He tries to break the keypad but well I think we knew that was not going to work. Bruce then does some reading and decides he is going to make a bomb. Well at this point Alfred has to step in, this scene was great because Bruce pretty much said if you are not going to help me well then I would like some tea. 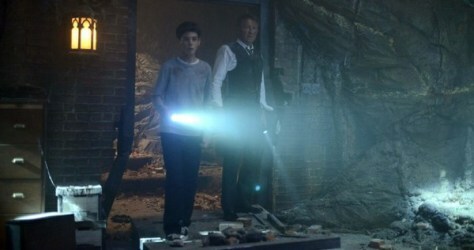 Alfred was not about to let a child make a bomb on his own so he helped Bruce and made tea. Well they managed to break into the room where Bruce finds a letter from his father. Yea, his dad knew that he was probably going to die so left some fatherly advice to Bruce. Well it seems Bruce will have to choose between happiness and what is right, I think we all know what he will choose. She is chilling with the Penguin, we all know the Cat allies herself in the most beneficial place. He is tending bar right now, since he was also kicked off the force but he is happy. He is not drinking and has a gf. Well he is now talking to himself in the mirror, so it seems that his personality has completely split or schizophrenia. Well she shows up to jail like she is going to a resort, yea I don’t think she gets the concept. It looks like she had a prison wardrobe made. While she is there she meets Jerome who wants to give her some advice. Is she about to become Harley Quinn? Barbara is able to manages to make friends with some of the guys. She was able to convince them to paint her nails, she has some talents. She is also making phone calls to Gordon and Leslie, where she is being crazy. Well there is a big jail break helped by one of the new inmate who is releasing a gas. Tabitha (Tigress) and her brother Theo Galavan who is a scientist for the city, broke out some of the criminals. Jerome and Barbara among them, it seems they are putting together a team. I first thought a possible suicide squad, but it was released the next day that the Court of Owls is coming to the show, I am guessing that. Unsure of Ivy and Dent at this time, but they did manage to cover most everyone. It looks like they are not doing a villain of the week like they said and will be making this all about the villains. There already seems to be a plot and various sub stories going on. If all the episodes are going to be like this one then I am really looking forward to seeing what will happen this season. 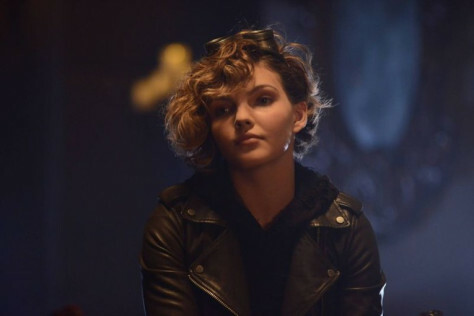 Posted on September 30, 2015, in gotham, TV Show Reviews and tagged Fox Gotham, gotham, Gotham Damned if you Do, Gotham Damned if you Do Recap, Gotham Rise of the Villains, Gotham S2E1, Gotham Season 2, Gotham Season Premiere. Bookmark the permalink. 1 Comment.